In the 1920s, Captain and Mrs Devine were known to have stayed at Cairds' Cave for several summers. Known to have been rather eccentric, they are shown sitting outside the cave. 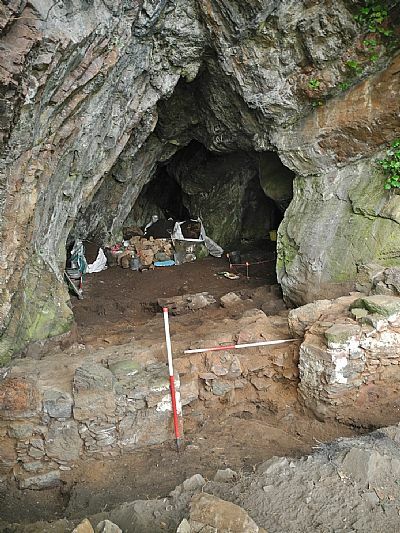 From the results of our 2011-2015 programme of survey and test pitting, we had gathered substantial evidence for lengthy use of the Rosemarkie Caves over the past 2000 years. 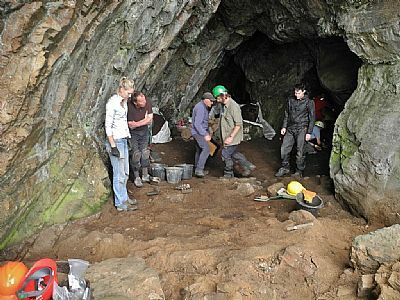 A number of the caves, in particular the Learnie group, had been visited or occupied sometime during the 7th-9th centuries AD. 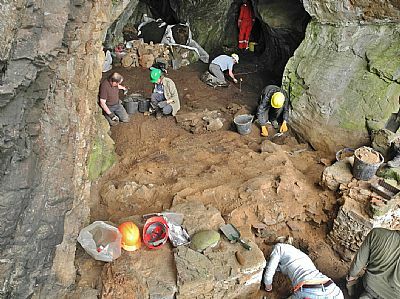 A test pit evaluation in Learnie 2B had revealed that there was significant potential for surviving archaeological deposits in this cave, which contained a substantial mortared stone wall at the entrance. The 2016 open-area excavation uncovered significant archaeological results, including evidence for iron-working activity and a c. 5th-7th century male inhumation burial. 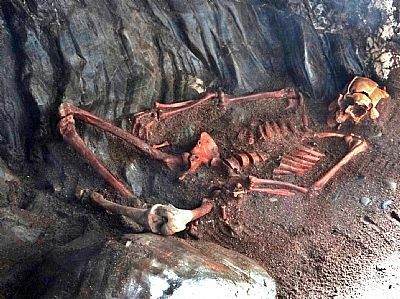 Found in a dark alcove below a post-medieval cobbled floor and midden deposits, the burial comprised the well-preserved remains of a young male who had suffered severe, multiple trauma to the head. The individual had been placed in an unmarked grave in a recess of the cave. He was situated in an unusual cross-legged position with large stones over the limbs and butchered animal bone over the location of the head. Potentially categorised as a 'deviant burial', this early medieval or 'Pictish' period rite appears to represent a deliberate act to weigh down the individual after death . The skeleton was forensically analysed and facially reonstructed by Dame Sue Black and her team at CAHID, University of Dundee. 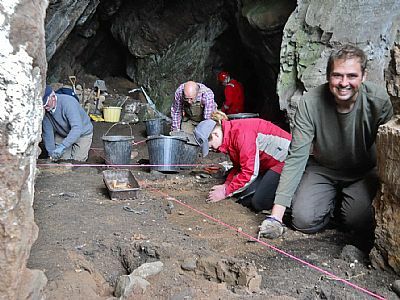 Also at the lowest archaeological horizon in the cave, a group of pits and cobbled features associated with considerable iron working residues have shown that metal-working was taking place within a defined area in the rear of the cave. The metal-working area respected the location of the burial, which may provide evidence that there is a relationship between this specialised activity and the burial placement. A sequence of archaeological layers covering the metal-working area, indicates that it took place before or during the early medieval period. The cave continued to be used at least intermittently through the medieval and post-medieval periods, where there appears to be a phase of significant occupation until a mortared stone wall across the entrance was put out of use. The cave continued to be in use subsequent to this, probably by travellers, who may have been employed specifically in shoe manufacture or repair. The fieldwork report on the 2016 excavation can be accessed here. 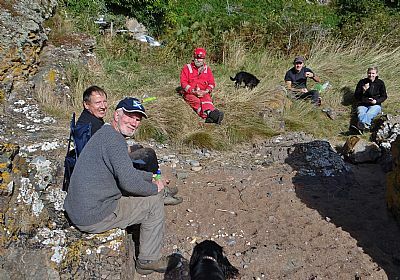 See also the blog post on Rosemarkie Man and the 2016 dig. The original "Rosemarkie Man" press release can be seen here.